Tagline- Your Favorite Creeps Are Together Again! The Comedy of Terrors apparently had a showing in 1963 before getting a theatrical release in 1964. 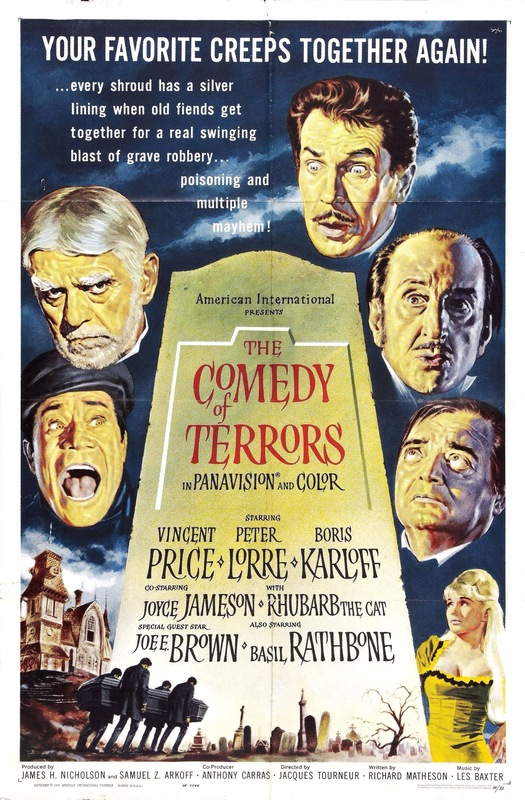 The Comedy of Terrors mixes horror and comedy and features quite a legendary cast with Vincent Price, Peter Lorre, Boris Karloff and Basil Rathbone. I really can’t think of a horror film with a better cast as all these actors are icons and it doesn’t end there as the script was by Richard Matheson and directed by Jacques Tourneur. Comedy of Terrors has amazing talent involved and it doesn’t really disappoint either, but with such talent involved the stakes are raised. While I enjoy horror and comedy there aren’t many though that would make my top list and slapstick, which this film often goes for can be hit or miss even within the same film for me. With his business failing Waldo Trumbull (Price) does what any good owner of a funeral parlor would do and that’s murder people to drum up business. Richard Matheson is perhaps best known for his novel I Am Legend and a year after this movie he’d co-write an adaption of it titled the Last Man on Earth, which starred Vincent Price. As a screenwriter Matheson’s most notable films are probably the Edgar Alan Poe adaptions directed by Roger Corman and starring Vincent Price with such films as House of Usher, Pit and the Pendulum and Tales of Terror. Richard Matheson also wrote a number of episodes of the Twilight Zone, while continuing to be a critically acclaimed author. The script for Comedy of Terrors has a simple plot, but the writing is quite sharp and often funny. Characters are terrific, which is a mixture of the writing and the actors involved. Comedy of Terrors is a well written spoof and while it can get a little too silly in spots it always remains funny. Director Jacques Tourneur is quite an iconic horror filmmaker and its s shame he isn’t talked about more. Curse of the Demon is seen as a classic of the genre and his work with Val Lewton with Cat People, I Walked with a Zombie and the Leopard Man are some of the most influential genre films of their time. Jacques Tourneur delivers a well made and well paced film and stages some terrific comedy. The film high on camp is a joy from opening to start and for me the best moments are the ones that border slapstick, but are held back just a notch. The more over the top gags are also quite funny, but for me after a bit slapstick can get a little tiresome and while here I always found it funny I did prefer the scenes where Tourneur held back just a bit. As mention the cast is legendary are is hands down one of my favorite casts of any genre. Vincent Price is hysterical as Waldo Trumbull and it was clear he enjoyed playing the role. Price was one of those actors that was so gifted he could even make a subpar film just a little better. My personal favorite Vincent Price film and performance was the Witchfinder General. 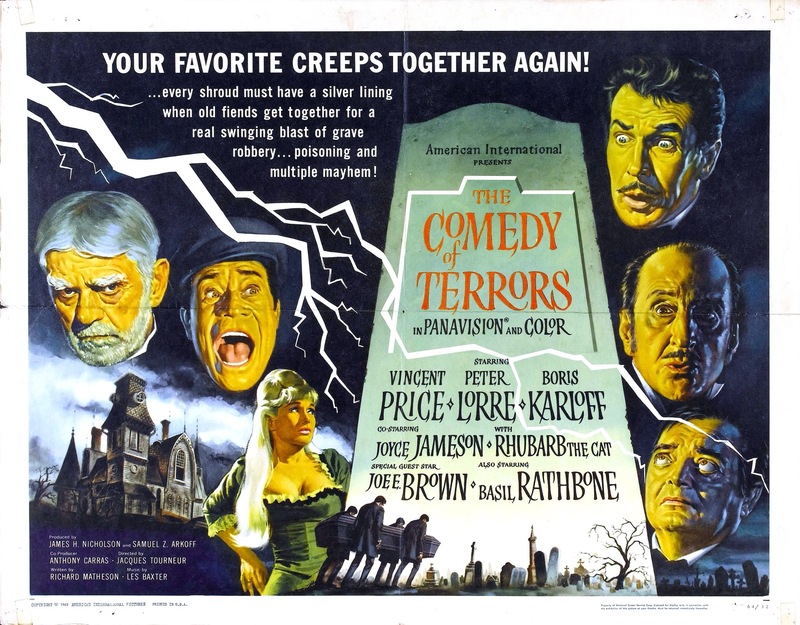 Price’s performance with Comedy of Terrors is no doubt one of my very favorites as well. He’s simply a joy to watch here and his work with Peter Lorre is a riot. Boris Karloff is one of my all time favorite actors and his performance in the 1931 version of Frankenstein despite having no dialogue is in my opinion amongst the greatest performances ever. At this stage in his career, Karloff was making a bit of a comeback thanks to Roger Corman, but his health was starting to decline and originally Karloff was cast as Mr. Black, but due to his arthritis he wasn’t able to play the demanding role and Basil Rathbone took over the part and Karloff took the role of Amos Hinchley. Karloff’s comedic timing is excellent and I’ve seen many Karloff films and this could very well make my top 5 Karloff performances. Basil Rathbone is best known for his performances as Sherlock Holmes, but he’s no stranger to the horror genre and one of his most notable horror roles came in Son of Frankenstein, which also happened to be the last time Boris Karloff played the Monster. Rathbone is simply outstanding in a wild performance as John Black. Like a true pro Rathbone and the rest of the cast aren’t afraid to ham it up. Overall the Comedy of Terrors is a terrific film that’s quite funny throughout and while the comedy can be a little too over the top for me at times I never lost interest. As mentioned when you have the talent of the highest level involved the stakes are raised so I can see how some might be letdown, but with strong writing and directing a cast that is clearly having fun working with each other the Comedy of Terrors delivers the goods.